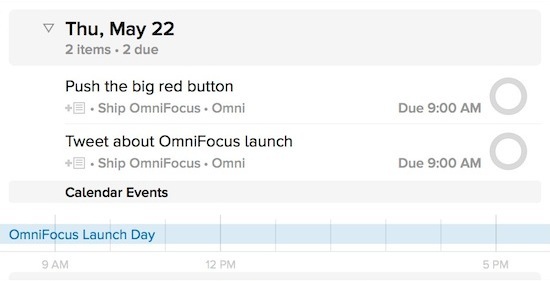 OmniGroup CEO Ken Case has announced that OmniFocus 2 will ship Wednesday, ahead of the stated June date announced earlier this year. With a variety of improvements and another round of testing, the latest version is set to go live May 22nd, a refreshing change of pace from “June” meaning June 30, or even sometime later in the year. I'm guessing this isn't actually what Ken Case's calendar really looks like. OmniFocus is virtually an institution of productivity software, an app that helps people juggle multiple projects for both home and work. This new version was a long time coming, having started as a demo at Macworld last year, then beta testing generated a lot of feedback. OmniFocus is popular around TMO Towers, and is most likely the reason many things in the Apple community happen at all, given that it counts David Sparks, Merlin Mann, and Don McAllister among its fans. Adding the iPhone and iPad versions helps keep everything with you, everywhere you are. While not an inexpensive solution, it is industrial strength, so if you have many things to juggle (and who doesn’t?) this is definitely a system worth a closer look.